LIFE is so mystical... truly has a divine meaning that transcends human understanding. It is a form of creation that only GOD knows WHEN, WHERE and HOW it will begin and end. There is no human power that can manipulate any LIFE's journey. I just want to share with you this story because I consider it as an unforeseen event in my life and it made me realized that some things may happen beyond expectation and may surprise me anytime. This morning, an incident happened that threatened mine and my son's life. I thought we would crashed head on collision with a certain jeepney that suddenly appeared rushing like racing with another jeepney. The service tricycle we're riding going to school promptly stopped just in time. Thank GOD for the driver's alertness and quick instinct, no one's hurt especially his daughter situated in front of him and PRAISE GOD for nothing happened to Kiko and me. I almost find myself helpless in this kind of situation but a MERCIFUL HAND was there to protect and keep us from harm. I need to forget about it since we did not even saw its plate number though I want them to be punished and penalized for making us fear for our lives. Those irresponsible jeepney drivers are careless and reckless. They don't seem to mind others' safety. If they want race... they should go to a race track and never put one's life in DANGER. Department of Justice issued its Advisory Opinion No. 03 which aims to provide guidelines to the general public, especially motorists, regarding road safety. 1.OVER-SPEEDING - There are prescribed maximum allowable speeds for various road types according to width, flow of traffic and location(high risk areas). These are detailed in RA 4136 which describes the proper speed prescribed by law as:"(1) a speed that is careful and prudent, not greater or less than what is reasonable and proper considering traffic, road and other existing conditions, (2) a speed that will not endanger the life, limb and property of any person, and (3) a speed that will permit a driver to bring his vehicle to a stop within the assured clear distance ahead." 2. DRUNK DRIVING - The Advisory states that this is a graver abuse than reckless driving.Section 53 of RA 4136 prohibits any person from driving a motor vehicle while under the influence of liquor or any narcotic drug. "Once proven to be drunk... a person can be held liable for driving under the influence of alcohol, which is a graver abuse than reckless driving," the Advisory read. 3. DISTRACTED DRIVING - This type of irresponsible driving is a form of reckless driving, according to the Advisory, because "it deviates a driver's attention away from the road, causing him to commit acts or omissions that may endanger himself and others." Examples of this type include conversing with another person in the vehicle or on the phone, retrieving objects on the floor, dashboard, eating or drinking, adjusting car radios, and using gadgets and devices like mobile phones, laptops, iPads, iPods/MP3 players or PGS-enabled devices. DOJ issued advisory points to the public and one of these points seem to apply on the incident just took place this morning. "RECKLESS DRIVING, DRUNK DRIVING AND DISTRACTED DRIVING ARE VIOLATIONS OF THE LAW IN THEMSELVES. THEY NEED NOT RESULT IN DAMAGES, INJURIES OR EVEN DEATH FOR THEM TO BE PUNISHABLE"
This is true, there's so many irresponsible jeepney drivers who would just cut you and without even given proper signals. They make the roads more traffic. That's scary with the drug thing but its logical as they are trying to muster more energy to take in more trip than usual so they resort to drugs. you should have taken note of the plate numbers, they deserve to be punished for being reckless drivers... i too hate those reckless drivers, I swear! That driver was so lucky... We're not able to see his plate number. If ever, my husband will definitely take actions. Sometimes, I just can't help but get pissed off with those jeepney drivers. They're just annoying. Haha! Maybe, they want to prove something... they don't deserve a LICENSE. They should be blacklisted! Oh my! Nakakatakot. Buti na lang walang nangyaring masama sa inyo. It's a matter of seconds... it would have been a disastrous accident! These kind of drivers still don't realize that the lives of their passengers are at risk. I hope they will become responsible enough. They don't deserve to be on the wheels, driving like they own the roads. We can only PRAY in behalf of them because I'm sure they don't say a prayer before hitting the streets. Hay! Jeepney drivers! They go around driving as if they are the kings of the road. Then when they bump your car, they first try to blame you for it. After that, they start giving you a sob story about not having any money to pay for the damages they inflicted on your vehicle, which wouldn't have happened if they were more responsible drivers. Worst part, you try to discipline them, they throw a fit and launch into a strike. Accidents happen everyday and drivers are either under the influence of drugs, intoxicated with liquor or worst is... have a license but never knew traffic rules in the first place. A lot of drivers nowadays have no regard for the safety of others. I honestly don't know what these guys are thinking. They don't deserve their licenses if they can't be careful on the road. Good thing nothing happened to you guys. Thank GOD, we were both safe, Ms Maricel. If something bad happened... I really don't know what to do then because it was so fast and I felt very nervous. hindi kaya may LBM yung driver. Kidding aside, dapat lang salain ng LTO ang bibigyan ng license. In our place, even a 14 year kid drives a jeepney. I dunno where o who gave him a license. I wonder how that driver and the rest of the reckless ones secure their license? Oh my! I also have my fair share of accidents dahil sa mga reckless drivers pero I am still thankful kasi there is someone above who is always watching us. Minsan napapaisip ako paano sila nagkakaron ng license e.
Roads are not safe with this type of drivers. STRICT implementation of the rules should be observed. it's like they own the road. same goes for buses. WOW! Sobra naman silang ASSUMING Chef Jasper. I hope their license will be revoked. These negligence and ignorance may be the primary reasons why more and more accidents happen everyday. Thank goodness you guys are OK! you should have reported it to the nearest police station para matauhan...tc! Thanks for the concern, madam. Praise GOD for protecting us. Katakot para kang lilipad una yung kaluluwa mo maiiwan yung katawan mo sa takot. I experience this kind of a scene. Nabigkas ko mamatay sana yung driver sa galit ko. whew! and these events always make me heart almost explode from my rib cage... especially in manila.. I am an advocate of road safety. I have also written articles about it. But we also need people to volunteer and act on it. Here in Bacolod we have Project C.a.r.e.s headed by May Cueva. Those jeepney drivers were probably rushing to get more passengers ahead. Truly, His hands is always ready for the safety of those who trust in Him. Here in Davao, our local government has installed cameras in every corner of the street so they can monitor reckless drivers and also pasaway passengers. There are lots of reckless drivers out there. They need to punished by law and need to have a proper orientation over and over again. This does not just apply to Jeepney drivers but to also to other types of vehicles. 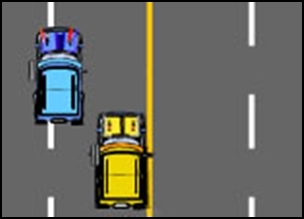 Driving wrongly or recklessly can make your vehicle into a deadly weapon. There are enough laws about it, what is required is strict implementation and also education. Generally, let us strip the license of these reckless drivers. Driving is a privilege and not a right. May I add? defective or old type of Jeepneys often results into malfunction that causes severe damage to anyone riding or around that jeepney. So sad to know that, we have a law about this but this law don't have any "Pangil". It is not implemented very well. If the government agency who are assigned on this law should implement it very well. Include SMOKING while having a "No smoking" sticker in their jeepney. Pisses me off! these reckless drivers should have their licensed confiscated, then revoked and never be issued with a license again. Yahweh bless. First, thank God both of you were safe. Second, those drivers should be dealt with with the fullest extent of the law. So many lives have been lost due to irresponsible driving. It is quite irritating to see drivers not paying attention to their driving.